When UNESCO cast its beady, critical eye on Japan 18 years ago to assess the country’s cultural and natural merits with a view — in the agency’s ponderous prose — to “inscription on the World Heritage List,” it settled on four places that became the nation’s first entries to those ranks so adored by tourism associations. Those four comprised the lush, rain-every-day island of Yakushima, which lies 70 km off the southern tip of Kyushu in Kagoshima Prefecture; the still largely virginal forests of Shirakami Sanchi straddling Akita and Aomori prefectures in northern Honshu; the beautifully deadly fortress of Himeji Castle in Hyogo Prefecture; and the Buddhist monuments of Horyuji in Nara Prefecture. It may have come as rather a surprise to some that Horyuji, located 14 km southwest of the city of Nara, should have been selected ahead of obviously much more famous Kyoto — and indeed Nara itself. But Horyuji really is exceptional. 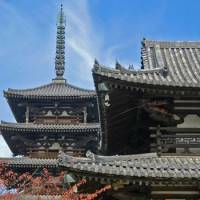 As well as being a landmark in Japanese history and the oldest existing Buddhist temple in the land, the complex of Horyuji contains the world’s oldest wooden buildings. The name most closely associated with Horyuji is that of Shotoku (574-622), who as prince regent is credited with having dispatched the first envoys to China and promulgating Japan’s first national constitution. He also made enormous efforts to promote the incipient faith of Buddhism. After his death, Shotoku rose to a position of hugely popular esteem, and many colorful folk myths were recounted about the man. But the prince not only became very dear to Japanese hearts, he also grew very dear to their wallets: Before being supplanted in 1984, his was the face that graced the ¥5,000 and ¥10,000 notes. 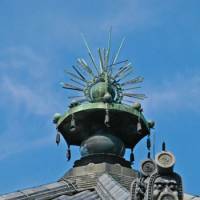 It was Shotoku who probably founded Horyuji, which was first built in 607, just 20 years after the official espousal of Buddhism. The original buildings were reportedly destroyed by fire in 670, and reconstruction on the present site, northwest of the original, began during the next decade on a larger scale. The approach to Horyuji today from the otherwise unremarkable town of Ikaruga is suitably impressive in the form of a grand avenue of stately black pines. And once among the temple precincts, a benign air hangs over the place — even when it swarms with gaggles of excursion schoolkids blithely indifferent to it all in their away-day excitement. Horyuji is divided into two areas, and it is the larger Western Precinct that visitors enter first. This contains the Main Hall (Kondo), a five-story pagoda and the Central Gate, dating from around 710, that are the temple’s oldest buildings. In the construction of Horyuji, there was a significant break with tradition in that the Kondo and pagoda are arranged side by side rather than following the traditional axial plan. Despite this novelty, the buildings themselves reflect architectural styles common in China a century earlier. 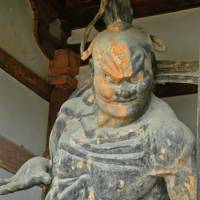 The Kondo features several bronze statues of Buddhas cast around the time of Horyuji’s founding and notable for their expressions of naive complacency. But it is the 34-meter-high pagoda that exerts the greatest attraction. In ascending order, the five roofs diminish in size in the proportions of 10:9:8:7:6. The roofs also get progressively steeper, lending an overall soaring effect — as if the thing is about to leap off into flight. 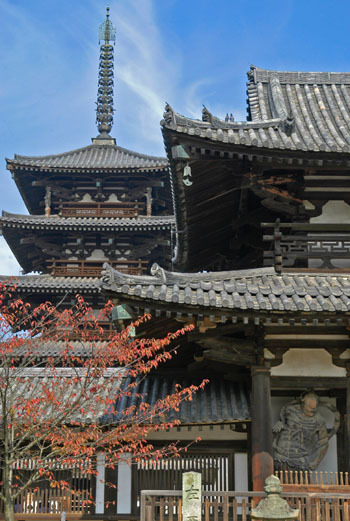 As well as being aesthetically pleasing, the pagoda is a monument to architectural genius. 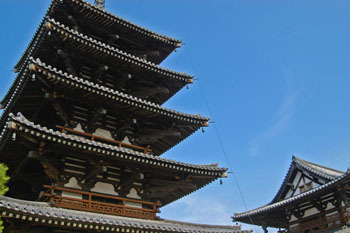 The pagoda is like a stack of five boxes resting on top of one another, pegged together by a central column called the shinbashira — an arrangement unique to Japan. Each story is able to slide horizontally independent of the others. In the event of a sudden shock, each floor transfers its kinetic energy to the shinbashira, whence it is safely dispersed to the ground. 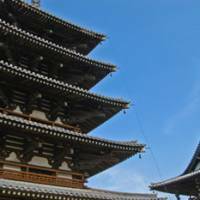 Thanks to this design, the pagoda has been able to withstand all the earthquakes and typhoons that have been thrown at it since the eighth century. It rocks. Around the base of the pagoda there appear a series of clay bas-reliefs depicting famous moments in Buddhist history. The most striking of these is the north tableau, portraying the death of the historical Buddha: the bodies of his elderly disciples are distorted in a grief and despair whose power has not diminished over the intervening 1,300 years. However, as these bas-reliefs are pointlessly kept in darkness, you won’t see a thing unless you’re packing a torch. In 1941, commemorating the 1,350th anniversary of the death of Shotoku, a museum called the Daihozoden was built beside the Western Precinct to house Horyuji’s outstanding Buddhist artworks. 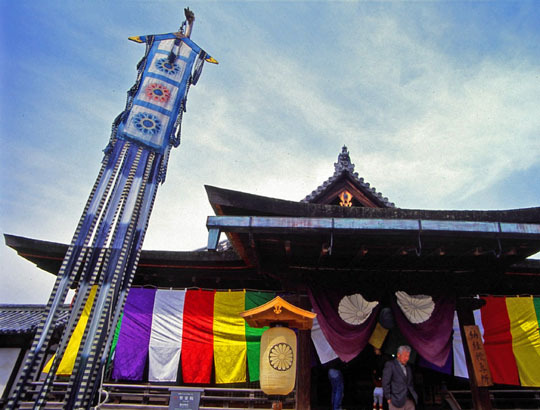 Among these, the most magnificent is the extraordinary, tall, willowy form of the Kudara Kannon, which manages to be at once both mild and imposing. 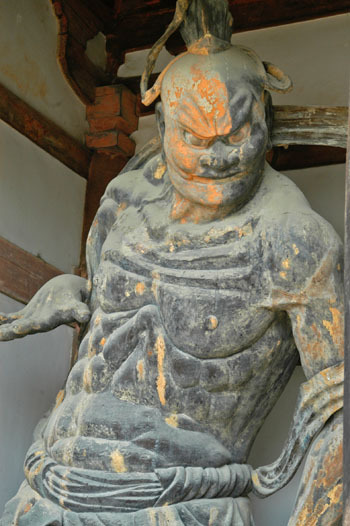 Though Kudara is the Japanese name for the ancient Korean kingdom of Paekche, the origins of this unique, intriguing statue are unknown. Beyond the Daihozoden, in the Eastern Precinct, the most striking building is the Hall of Dreams (Yumedono), an octagonal pavilion whose roof is surmounted by a dramatic “flaming jewel.” True to its evocative name, a sense of mystery seems to hover over this unusual structure. Among the stories accounting for its name, one recounts how, after devout Shotoku had been pondering the Sanskrit scriptures, a strange old geezer appeared to him in a dream and obligingly explained all the difficult bits. Not far from the Hall of Dreams stands the nunnery of Chuguji, which is not so remarkable for its architecture. 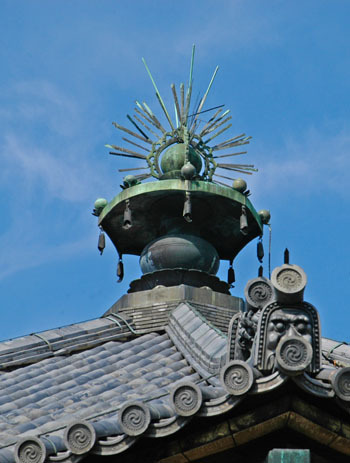 But even if the monumental structures of the Western Precinct didn’t exist, it would be worth trekking out to Horyuji simply to view Chuguji’s main sacred object. Housed here is the delicately refined wooden image of the bodhisattva Maitreya that is arguably the finest sculpture in Japan. Appropriately for Horyuji, which has such strong foreign leanings, it is not known whether the hand that crafted this gem was Japanese or Korean. In camphor wood, darkly tanned by centuries of incense smoke, the bodhisattva is a slim figure, smiling sweetly and pensively, his right hand beneath his chin, his arm resting on his knee. And it is possible here to be the most deeply pious of atheists and still feel spiritually moved by the sheer sublimity of the masterpiece before you. Getting there: Nara is just over 40 minutes by JR train from Kyoto. From JR Nara Station, Horyuji Station can be reached in 12 minutes. It is then a 20-minute walk or 5-minute bus ride to the temple complex.